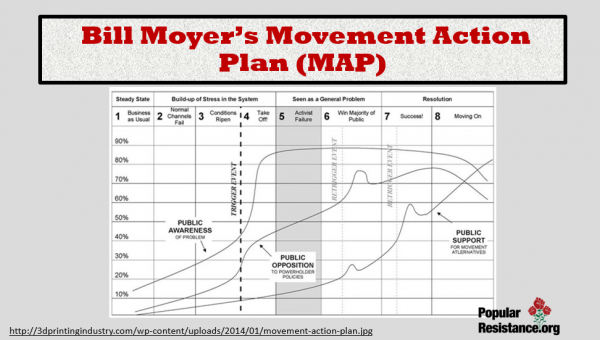 We discuss Bill Moyer’s Movement Action Plan: The Eight Stages of Successful Social Movements, including the political environment of each stage and the tasks of the movement in each stage, particularly stages one through five. 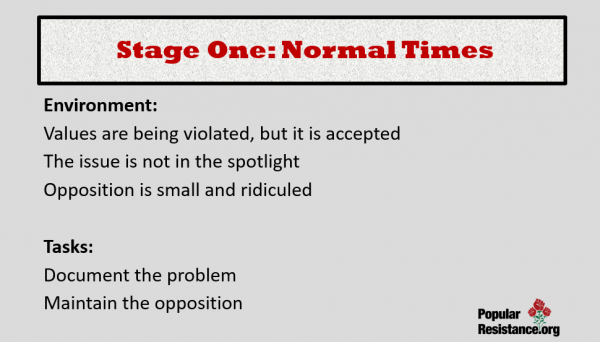 In this first stage—normal times—there are many conditions that grossly violate widely held, cherished human values such as freedom, democracy, security, and justice, and the best interests of society as a whole. Moreover, these conditions are maintained by the policies of public and private powerholders, and a majority of public opinion. Yet, these violations of values, sensibilities, and self-interest of the general society are relatively unnoticed; they are neither in the public spotlight nor on society’s agenda of hotly contested issues. Normal times are politically quiet times. Some past normal times were the violations of Blacks’ civil rights before 1960; the Vietnam War before 1967; and U.S. intervention in Central America and support for Marcos, Duvalier, and apartheid before 1985. The opposition of these conditions and policies is small and receives more public ridicule than support. Consequently, its efforts are relatively ineffective. There are three major kinds of opposition: professional opposition organizations (POOs), ideological or principled dissent groups, and grassroots groups that represent the victims. 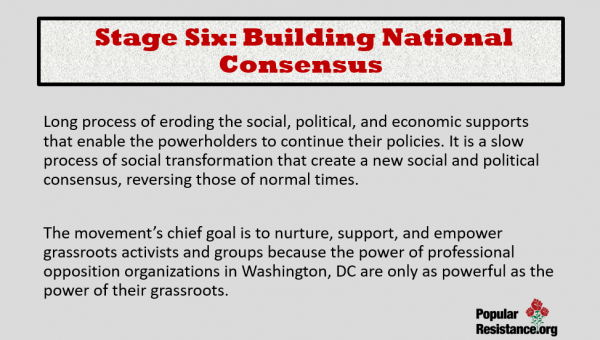 The professional opposition organizations are centralized formal organizations, often with national offices in Washington, D.C., which try to win achievable reforms through mainstream political channels such as the electoral process, Congress, and the courts. They are hierarchical, with a board of directors, strong staff, and a mass membership that carries out nationally decided programs. These efforts have little success because they do not have sufficient public support to provide the political clout required to create change. The principled dissent groups hold nonviolent demonstrations, rallies, pickets, and occasional civil disobedience actions. These groups are usually small, little noticed, and ineffective at achieving their demands. Through their symbolic actions, however, the principled dissent groups are a shining moral light in the darkness. The grassroots groups are composed of local citizens who oppose present conditions and policies but do not yet have the support of the majority local population. They represent the victims’ perspective, provide direct services to victims, and also carry out programs similar to those of the other opposition groups. The powerholders often promote policies that support the interests of society’s privileged and powerful, and which violate the interests and values of the society as a whole. The powerholders maintain these policies primarily by keeping them out of the public spotlight and off the society’s agenda of contested issues. They have to keep these policies hidden from the general public because they know that the populace would be upset and demand changes if they knew the truth. The powerholders are able to maintain these policies and keep them hidden from the public by successfully carrying out their two-tact strategy of highly proclaiming their official doctrine and policies, stated in terms of the society’s values and interests, while hiding from the public their actual or operative doctrines and policies. 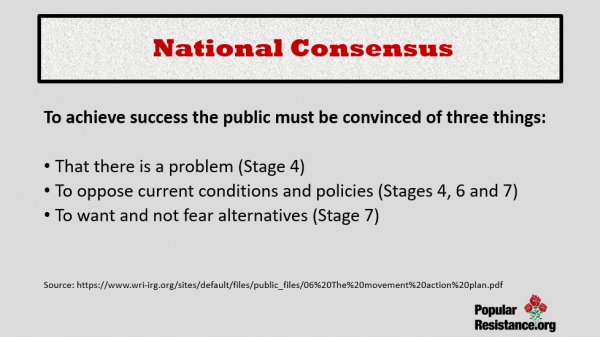 A political and social consensus supports the powerholders’ official policies and status quo because the public does not know that the government is actually functioning according to the opposite operative doctrine policies. Consequently, the general populace is unaware that the social conditions and public policies violate their values and self interests; or, when they do know, they believe the justifications as to why they can’t be changed or are needed to protect a higher cause or value. As a result, the public is not aware that there is a serious problem. Possibly only 10 to 15 percent of the population disagrees with the powerholders’ policies. Normal times are politically quiet times because the powerholders successfully promote their official doctrine and policies while hiding their actual operative doctrine and policies, thereby keeping the violations of conditions and their policies out of the public consciousness and off society’s agenda. The opposition feels hopeless because it seems that the situation will continue indefinitely, and they feel powerless to change it. Beneath the calm surface, however, the contradictions between society’s values and the powerholders’ actual, operative policies hold the seeds for popular discontent that can create dramatic changes. The intensity of public feeling, opinion, and upset required for social movements to occur can happen only when the public realizes that the governmental policies violate widely held beliefs and values. The public’s upset becomes especially intensified when official authorities violate the public trust by using the power of office to deceive the public and govern unfairly and unlawfully. Hannah Arendt wrote that “people are more likely driven to action by the unveiling of hypocrisy than the prevailing conditions. “This was clearly shown by the dramatic turnaround of the American public’s opinion of President Reagan after Irangate exposed that instead of acting on his official policy of leading the world’s defiant fight against terrorists, his operative policy was actually cooperating, supporting, and making deals with terrorists. Prove that the official doctrine and policies of governmental powerholders and institutions violate society’s values and the public trust. This must be not only from researching the facts but also from actually trying every avenue for official citizen participation in the democratic process for deciding on social policies and programs, and proving that they do not work. Prove that they are “kangaroo courts”. Go to every decision-making body whether welcome or not. Positive results are not expected now. The point is not to win the cases, but to prove that the powerholders are preventing the democratic system from working. Eventually, however, some of these cases might actually be won and have the powerful impact of creating a movement and social change. After twenty years in the courts, for example, the NAACP Legal Defense Fund’s case of Brown vs. U.S. was won in the Supreme Court in 1954. It established the principle that “separate but equal” was no longer the law of the land, which became a legal basis for the civil rights movement. The powerholders fight the opposition through the normal channels, usually winning easily while continuing their operative policies and programs. The powerholders do not feel much threatened or concerned, and they handle the situation as a problem of bureaucratic management rather than a crisis of public confidence and power. Through the mass media, they easily promote their official policies while hiding their operative policies thus successfully keeping the whole potential problem out of peoples’ consciousness and the public spotlight, and off of society’s agenda. Public opinion and social consensus continues to support the government’s official policies and status quo, as the consciousness of the general population remains unchanged. Yet, even the low level of evolving conditions and opposition causes public opinion against these policies to rise from about 10 to 20 percent. Except for the rare media coverage of opponents’ activities, the problem is still neither in the public spotlight nor on society’s agenda of contested issues. Document the citizens’ attempt to use the normal channels of citizen participation and prove that they did not work. 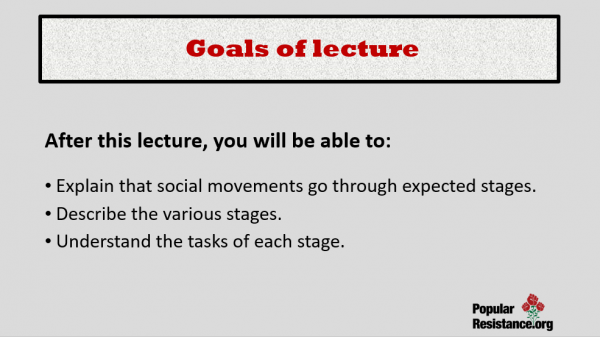 The “take-off” of a new social movement requires preconditions that build up over many years. These conditions include broad historic developments, a growing discontented population of victims and allies, and a budding autonomous grassroots opposition, all of which encourage discontent with the present conditions, raise expectations that they can change, and provide the means to do it. The historical forces are usually long-term, broad trends and events that worsen the problem, upset subpopulations, raise expectations, promote the means for new activism, and personify the problem. They are mostly outside the control of the opposition. For example, some of the historical forces that made the 1960s ripe for the Black civil rights movement included the emergence of independent Black African countries, the large Northern migration of Blacks who maintained their ties to the segregated South, the rising black college student population, and the 1954 Supreme Court’s Brown vs. U.S. decision that provided a legal basis for full civil rights. The growing numbers of discontented local people across the country quietly start new autonomous local groups, which as a whole form a “new wave” of grassroots opposition, which is independent from the established POOs. These groups soon become frustrated with the official institutions, channels, and powerholders, which they realize are totally biased in support of the status quo; and they become The Movement Action Plan 15 increasingly upset with some of the established POOs, whom they see as working in a dead-end process with the powerholders. A public consensus to support the powerholders’ policies, and the problem remains off society’s agenda. 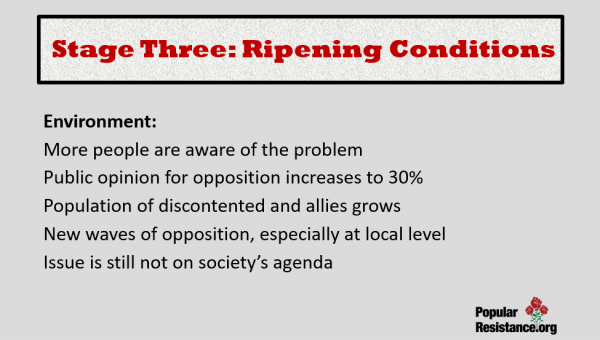 Yet, the growing public awareness of the problem, discontent, and new wave opposition, primarily at the local level, quietly raises the public opinion opposing current powerholder policies to 30 percent, even though the issue remains off society’s agenda. New social movements surprise and shock everyone when they burst into the public spotlight on the evening TV news and in newspaper headlines. Overnight, a previously unrecognized social problem becomes a social issue that everyone is talking about. It starts with a highly publicized, shocking incident, a “trigger event”, followed by a nonviolent action campaign that includes large rallies and dramatic civil disobedience. Soon these are repeated in local communities around the country. The trigger event is a shocking incident that dramatically reveals a critical social problem to the general public in a new and vivid way, such as the arrest of Rosa Parks for refusing to move to the back of a Montgomery bus in 1955, NATO’s 1979 announcement to deploy American Cruise and Pershing 2 nuclear weapons in Europe, or the Marcos government’s shooting of Ninoy Aquino as he arrived at the Manila airport in 1983. Trigger events can be deliberate acts by individuals, governments, or the opponents, or they can be accidents. By starkly revealing to the public that a social condition and powerholder policies blatantly violate widely held cherished social values, citizen self-interest, and the public trust, the trigger event instills a profound sense of moral outrage in the general populace. Consequently, the general population responds with great passion, demanding an explanation from the powerholders and ready to hear more information from the opposition. 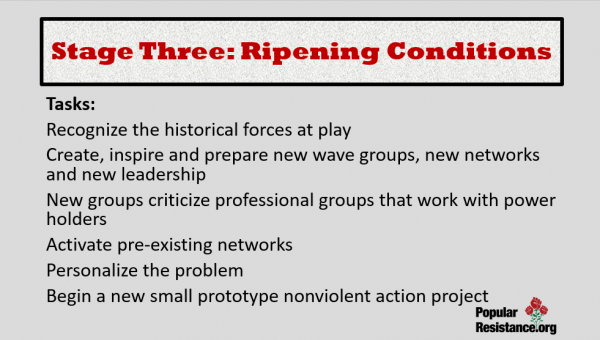 The trigger event is also a trumpet’s call to action for the new wave opposition groups around the country. A new social movement is created only when the opposition organizes a dramatic nonviolent action campaign immediately following the trigger event and when the nonviolent action campaign is repeated in local areas across the country. The nonviolent action campaign keeps the public spotlight on the problem and builds social tension over time. This “politics as theater” process becomes a social crisis, which turns the problem into a public issue. The shooting of Aquino, for example, was followed the next week by a million people in a Marcos-banned funeral march down the streets of Manila, and the NATO Cruise and Pershing 2 decision was followed by gigantic protest demonstrations in the capitols of Europe. The public, altered by the mass media because of the trigger event and nonviolent action campaigns, is outraged by the contradiction between its values and the social conditions and powerholders’ operative policies. The new movement groups join the powerholders as the keepers of society’s values and symbols. Participation in the new movement gives meaning to many peoples’ lives because it gives them an opportunity to act out their beliefs, feelings, and spirituality. The powerholders are shocked, upset, and angry. They realize that the genie is out of the bottle. They have lost on the first law of political control: keep issues out of people’s consciousness and the public spotlight, and off society’s agendas. They take a hard line in defending their policies and criticizing the new movement, calling it radical, irresponsible, and even communist-inspired. While some liberal politicians support the movement’s position, mainstream Republicans and Democrats alike continue to support existing government policies. Put the powerholders’ policies in the public consciousness and spotlight and on society’s agenda of contentious public issues. The take-off stage is an exciting time of trigger event, dramatic actions, passion, a new social movement, public spotlight, crisis, high hopes and output of energy. 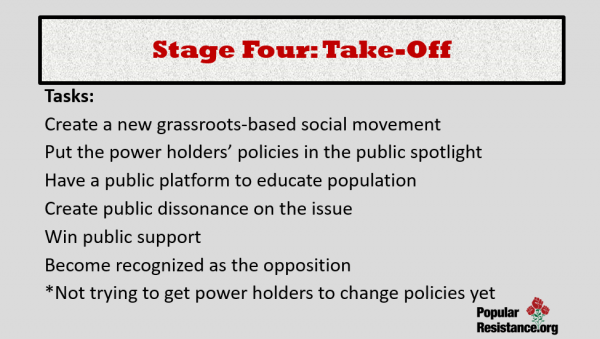 Both a previously unrecognized social problem and official policies become a public issue, and within two years a majority public opinion is won.But take-off is the shortest stage. 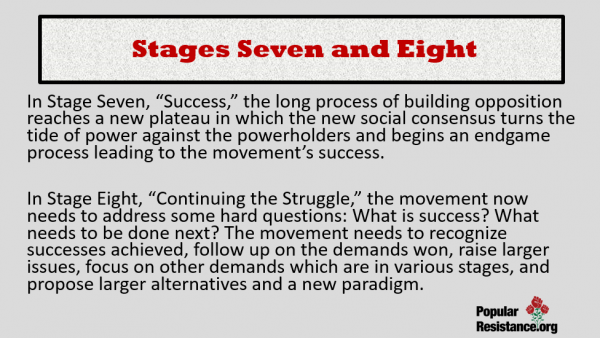 After relatively rapidly achieving the goals of this stage, the movement progresses to Stage Six. 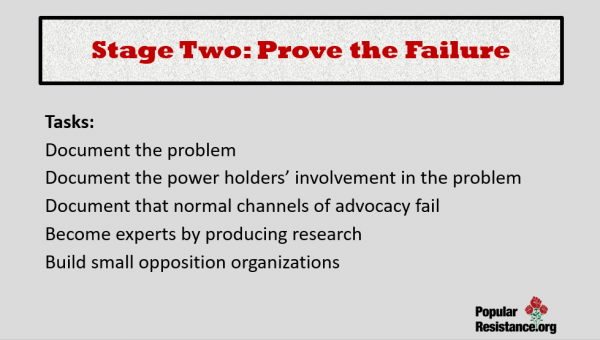 However, many activists don’t recognize this success. 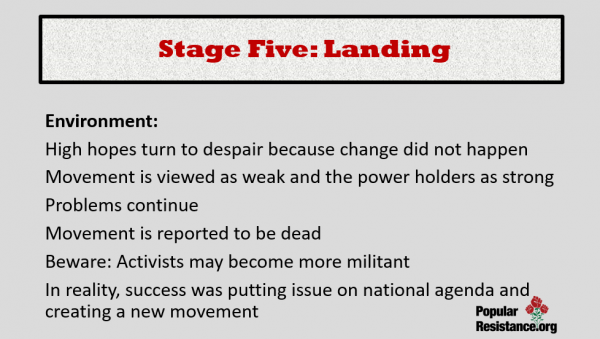 Instead, they believe that the movement has failed and their own efforts have been futile; consequently, they move to Stage Five. The movement has not achieved its goals. After two years of hard effort, which included big demonstrations, dramatic civil disobedience, arrests, court scenes and even time in jail, media attention, and even winning a majority of public opinion against the powerholders’ policies, the movement has not achieved any of its goals. The government is still waging the war in Vietnam, building five nuclear weapons a day, or sending aid to the contras. The problem, however, is not that the movement has failed to achieve its goals, but that expectations that its goal could possibly be achieved in such a short time were unrealistic. Achieving changes in public policies in the face of determined opposition of the powerholders takes time, often decades. Judging that the movement has failed because it has not achieved its goals after two years is analogous to parents criticizing their daughter for not graduating after completing two years in college with straight “A” grades.Parents don’t do this because they know that achieving a B.S. degree is a four-year process. The movement, therefore should be judged not by whether it has won yet, but by how well it is progressing along the road of success. The movement has not had any “real” victories. This view is unable to accept the progress that the movement has made along the road of success, such as creating a massive grassroots-based social movement, putting the issue on society’s agenda, or winning a majority of public opinion. Ironically, involvement in the movement tends to reduce activists’ ability to identify short-term successes. Through the movement, activists learn about the enormity of the problem, the agonizing suffering of the victims, and the complicity of powerholders. The intensity of this experience tends to increase despair and the unwillingness to accept any short-term success short of achieving ultimate goals. “What difference does it make that a majority of the American people and Congress oppose contra aid, when people are still being killed in Central America?” This is another version of judging the movement for not having achieved its ultimate goals rather than by whether it is making reasonable progress along the road. The power holders seem too powerful—they have not changed either their minds or their policies, but defiantly proclaim them louder than ever, totally ignoring the protests of the movement and the objections of half of the populace. 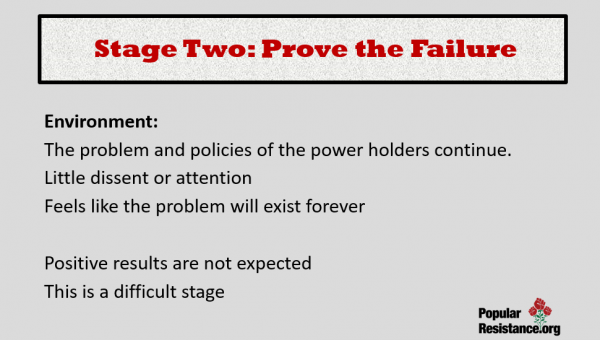 The failure of the central powerholders to change either their minds or policies is a poor indicator of the movement’s progress. The central powerholders will be the last segment of society to change their minds and policies. The longer that the public sees that the powerholders are violating social values and ignoring the democratic majority opinion, the higher the political costs to the powerholders for continuing those policies. Continued used public exposure of the powerholders upholding these policies in the face of public opinion, therefore, can be an indicator that the powerholders’ original goal of keeping the issue out of public consciousness and off the society’s agenda is failing. For example, with increasing worldwide media coverage of President Botha’s proclamations of apartheid and the effects of this policy, the world’s resistance to apartheid increases. The powerholders and mass media report that the movement is dead, irrelevant, or non-existent. The powerholders and mass media not only report that the movement is failing, but they also refuse to acknowledge that a massive popular movement exists. Large demonstrations and majority public opposition are dismissed as “vaguely reminiscent of the Sixties”, rather than recognized as social movements at least as big and relevant as those 20 years ago. And when movements do succeed, they are not given credit. The demise of nuclear energy is said to be caused by cost overruns, high lending rates, lack of safety, Chernobyl and Three Mile Island, rather than from the political and public opposition created by the people power. By the end of take-off, many activists suffer from “battle fatigue”. After two years of virtual ’round-the-clock activity in a crisis atmosphere, at great personal sacrifice, many activists find themselves mentally and physically exhausted and don’t see anything to show for it. Out of quilt or an extreme sense of urgency, many are unable to pace themselves with adequate rest, fun, leisure, and attendance to personal business. 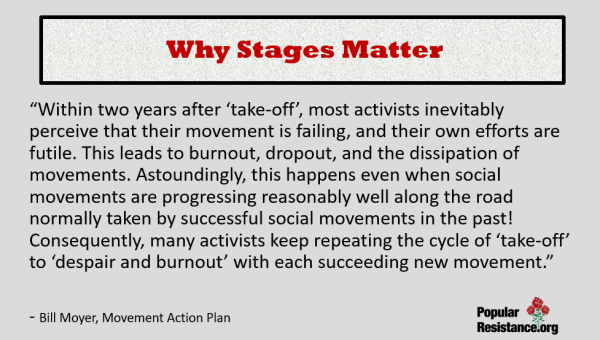 Eventually, large numbers of activists who were part of movement take-off lose hope and a sense of purpose; they become depressed, burn out, and drop out. Rebelliousness, machismo, and more “militant” action and violence are some of the negative effects of feelings of despair and powerlessness. The movement needs to make deliberate effort to undercut this problem. 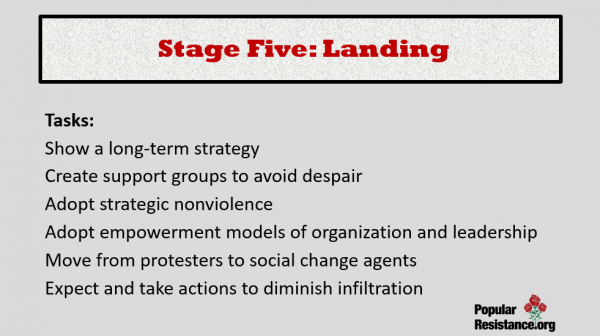 First, it needs to reduce the feelings of despair and disempowerment by providing activists with a long term strategic framework, such as MAP, which helps them realize that they are powerful and winning, not losing. Also, it is important that the movement adopt clear guidelines of total nonviolence, which are widely publicized and agreed to by all groups and activists which officially participate in the movement. The nonviolent policy must be enforced by having nonviolent guidelines and training for all demonstration participants, and by having adequate “peacekeeping” at all demonstrations. Adopt “empowerment” models of organization and leadership at both the national and local levels. The empowerment model is a third way that tries to maximize the positive and minimize the negatives of both the hierarchical and the loose models, trying to blend participatory democracy, efficiency, personal support, and effectiveness. This model of leadership more resembles the nurturing mother than the strong patriarchal father. While the national organization leadership need to coordinate and represent the whole movement, their primary goal should be to nurture the empowerment of the grassroots and foster democracy and non-elitism within the whole movement. Continue a hardline strategy, including escalating their policies to prove that they are in charge and that both the movement and public have no effect. The general populace experiences dissonance, not knowing who or what to believe. 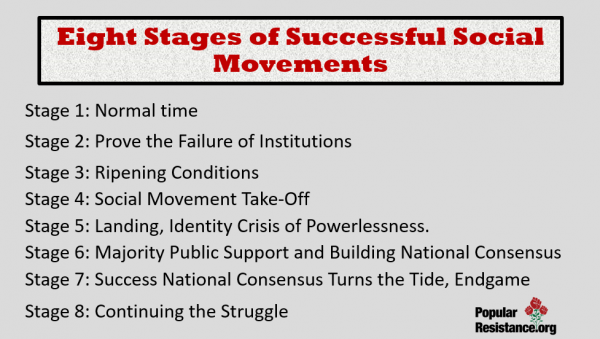 While many agree with the movement’s challenges, they also fear siding with dissidents and losing the security of the powerholders and status quo. The alternatives are unclear to them. The general citizenry is about evenly divided, 50 percent to 50 percent, between the powerholders and the movement. Movement violence, rebelliousness, and seeming anti-Americanism turn people off and tend to frighten them into supporting the powerholders’ policies, police actions, and status quo.